Landsat 7 false-color image of the Sydney area and surrounding suburbs. The image demonstrates how the built-up areas (pink) have been constrained by the Royal National Park to the south, the Ku-ring-gai Chase National Park to the north, and the Blue Mountains National Park to the west (a boundary that generally follows a geological feature called the Lapstone Monocline, dividing the Blue Mountains from the Cumberland Plain). This is a complete listing of the suburbs and localities in the greater Sydney area in alphabetical order. 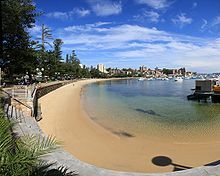 Sydney has about 38 local government areas, each consisting of several suburbs (suburbs in Australia are purely geographical, not political, divisions). See table below, Category: Suburbs of Sydney and Category: Local government areas in Sydney. Suburbs are listed here if they are inside the Sydney metro area, and are listed in the Geographical Names Register as being suburbs. For this list, the boundaries of the Sydney metro area are defined as the Hawkesbury/Nepean River in the north/north west, and then the outer boundaries of the City of Penrith, Camden Council, the City of Campbelltown and Sutherland Shire. Some but not all Sydney localities are also listed, and localities are shown in italics to differentiate them from suburbs. Further localities may be added if they are on the Geographical Names Register, are inside the Sydney metro area, and are also listed in the "Suburb and Localities Index" of the most recent (2019) edition of the Sydney UBD Street Directory. ^ "Name search". Geographical Names Register. Government of New South Wales: Geographical Names Board of New South Wales. Retrieved 23 July 2018. This page was last edited on 28 March 2019, at 21:18 (UTC).